Carpenter ants are easily confused with termites. Unlike termites the carpenter ant will emit a strong odor when disturbed. Before deciding on which natural ant control to use it's important to understand their nests and queen. You can read here about Grandma's Termite Control Guide . Carpenter queen ants can live up to 15 years and lay over 70,000 eggs. That's why it's best to locate their nest and eliminate the queen if you're having problems with carpenter ants. 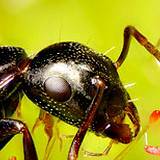 Carpenter ants are about ½ inch longer than most other ants. They have elbowed antennae's and will be black or bi-colored red and black or black and brown depending on the area of the country they reside in. The colony consists of a queen, male, minor workers, intermediate workers and the major workers. One nest may contain ants of all sizes and the major worker's, this is why they are easily confused with termites. Termites tend to remain at home until mating season, while carpenter ants travel about. What makes the world of carpenter ants unique is that when the nest becomes too large they tend to form satellite colonies in a nearby structure. There is usually only one queen and she remains in the parent colony. The ants will go back and forth from the satellite colony to the parent colony. There may be as many as 20 satellite colonies related to the parent colonies. Very much like communes that human families or like-minded-people have formed. Carpenter ants are normally beneficial insects that chew up mountains of dead wood and turn it into sawdust. But they can also be extremely destructive when they build their nest in wooden structures and new wood. The best way to get rid of carpenter ants is to figure out where their colony is. They tend to come out late at night and you can use some honey as ant bait, just place some on a piece of cardboard and they be so excited to find the honey they'll want to feed it to the queen right away and head right back to their nest. Keep an eye on where they go and you'll have a pretty good idea as to where their nest is located. It's important to find the parent nest, that's where you'll find the queen. When you find their entrance, drill small holes and blow boric acid in to fill their living spaces. Boric acid will kill them! Mix together 1 teaspoon of table salt and ½ teaspoon of white pepper in 1 quart of water. Spray directly on the ants. This recipe will kill the workers but not the queen. Mix together 1 tablespoon of honey, 1 tablespoon of canned cat food and 1 teaspoon of boric acid. Drop by teaspoons in locations you find ants eating when they bring this mixture back to their nest it will kill them, even the queen. 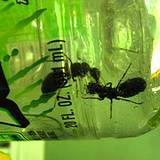 These ants are extremely smart and know enough to carry dry food over to water and let soak before eating. There is no doubt carpenter ants are survivors but they can be tricked into changing locations for their colonies. Find their nest and flushing out the queen is the tricky part and they can and will produce new queens so it's important to try to eliminate the entire colony that is close to your home.